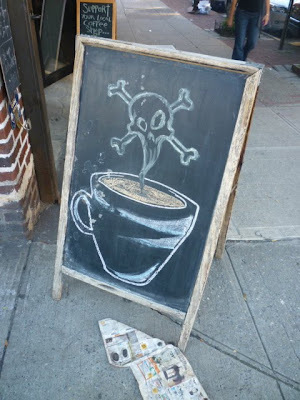 What exactly does Carroll Garden's Coffee Den want us to think about their coffee? 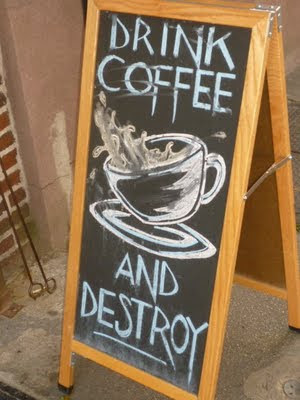 Drink their coffee and release your inner evil-doer! Something along the lines of: Anti-frou-frou-coffee. You're badass if you drink our coffee. No little cardboard holders to protect your dainty finger skin here. Lost City Asks "Who Goes to The Red Rose?" Where Does One Get a Good Coat Front These Days? Lost City Asks "Who Goes to El Paso?" For God's Sake, Let the Poor Bust Out! Amazement: The Lobster Is Back!